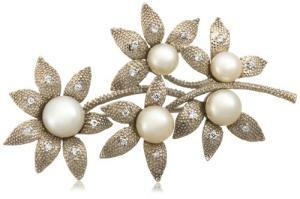 This gorgeous vintage-inspired brooch a tasteful and elegant touch. Beautifully crafted in bead-textured sterling silver, with sparkling cubic zirconia accents, it has a classic floral design. White freshwater cultured pearls accent the centers of the five flowers, which are arranged along gracefully curved stems. The brooch is finished in back with a standard locking pin clasp.